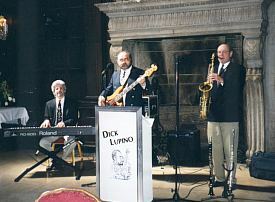 The most popular choice of musical entertainment for corporate receptions and cocktail hours is the Jazz Trio. Ranging from the elegant sounds of smooth jazz and standards from Duke Ellington, Louis Armstrong, Cole Porter and Frank Sinatra, to contemporary classics of Brazilian bossa novas from Jobin, and upbeat current sounds of Spyro Gyra or the soulful Grover Washington Jr.
Our versatile and talented jazz band musicians are alumni of some of the finest music schools in the country, including Berkley College of Music and New England Conservatory of Music. 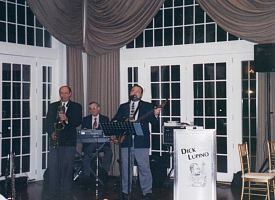 Jazz band groups are available in size, including solo, duo, trio, quartet and quintet. 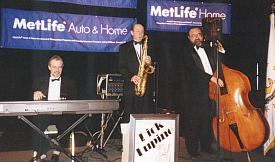 Numerous combinations of instruments are available, including piano, bass, saxophone (including flute & clarinet), guitar, drums, trumpet and vocals.